Conley has devoted over 50 years of service to the nursery industry with the development and implementation of quality greenhouse products. Over the years, the Conley name has become synonymous with reliability and value. 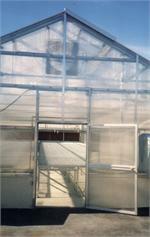 Long considered a leader in technological innovations, Conley incorporates only state-of-the-art designs, materials and manufacturing techniques in its production of greenhouse structures and related products. 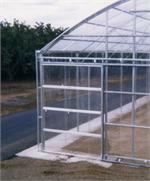 Greenhouse Benching Systems is one of Conley's specialties. They design and manufacture bench systems to fit every grower's needs. Available styles are: over-easy rolling, stationary, portable and more. An industry tradition, the Series 6500 Gothic Arch design is functional at both shedding snow and combatting overhead drip. This structure can be glazed in poly or rigid coverings. Available in 10 pound, 20 pound or 30 pound snow load. All doors come complete with tracks, frame jambs, flashing and hardware. Covering options: fiberglass, metal or polycarbonate. The versatility of the Series 7500 makes it ideal for applications ranging from growing to retail or even metal covered houses. This structure is designed to be glazed in poly or rigid coverings. Available in 10 pound, 20 pound or 30 pound snow load. Equally at home as a growing area or sophisticated retail center. The Series 2000 is designed for poly, shade or rigid coverings. Engineering available to customer's requirements. The best value for the dollar, Conley's Series 3600 is designed for poly roof coverings and poly, shade or rigid side and end wall coverings. Available with a 10 pound to 30 pound live load and up to 110 MPH wind loads.